When setting up a new business, you should pay careful attention to designing your company’s organizational structure. This should be decided according to your company’s size, industry and aims. You should think of organizational structures as communication flowcharts. Poorly conceived organizational structures will result in sluggish, inefficient communication in which managers at various levels are required to deliver information to too many people for too many levels of approval. Well designed organizational structures will produce efficient communication channels and encourage fast, clean decisions. Let’s take a look at several of the most common forms of organizational structures. The functional structure is the most commonly used by most businesses. It’s a top down flowchart with a high ranking executive at the top, with multiple middle managers – such as the human resources, marketing, accounting and engineering department heads – all directly reporting to the top executive. These departments are managed separately from each other by the department heads, and they only answer to the top level manager. The strength of this system is that it’s easy to understand, and keeps businesses neatly compartmentalized. However, the weakness is glaring – if a weak, poorly organized executive is at the top, then cases where the right hand fails to talk to the left will occur, causing frustrating problems. A variant of the functional structure is the product structure, which is designed for larger companies. 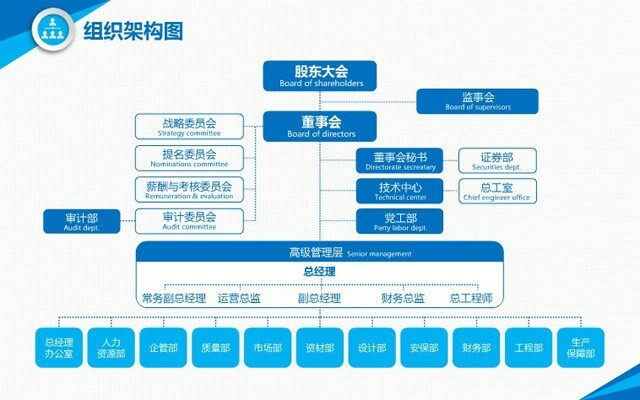 In this flowchart, a group of the highest executives sit at the top, while different products are separated into mini-companies. For example, a food products company might be split into beverages, snacks, dairy products, frozen dinners and condiments, with the managers of each segment reporting to the top. In this case, it won’t matter if the right hand fails to talk to the left, since products don’t depend directly on each other. If your company offers services, such as healthcare, you can use the customer-based organizational structure. This is simply a variation of the product structure, in which the different business segments at the bottom are each split into a specific customer group – for example, inpatients, outpatients and free clinic patients. The managers of each segment would then report directly to the hospital president at the top. This is also designed to avoid overlap, confusion and redundancies. If your company gets really big and starts to go national or global, you need to split your company structure into regional segments. This is also a variant of the functional structure, with the top executives based in your home country at the top, with the reporting segments being comprised of regional managers. This insures that your demands in different markets are being met in a localized fashion. Localization is the goal here, in all aspects – pricing, real estate and product lines. Large companies which have tried to use a single pricing strategy on a static product line across multiple geographic markets have often failed miserably, being eaten alive by smaller regional competitors. The matrix structure is often used by video game and movie companies, with various departments, all equal, working in tandem to produce a single final product. In this case, a strong manager at the top – such as a video game publisher or movie director – acts as a team leader to insure that each segment receives the data they need to complete their separate task. For example, in the production of a movie, one department might work on the music, the other might work on special effects, while another one works on the recorded film. Each segment must receive some information from the other – for example, a special effects team will need access to the filmed footage – and it’s the job of the movie director (at the top) to make sure all the threads of the web are connected to each other, then produce the finished product. While most companies use a variation of the functional structure, it’s up to you to figure out which structure best fits your company. You can also mix and match the best parts of each to create a customized structure. Just remember, the reason for having an organizational structure is to maintain communication and to make sure that there are as few redundancies as possible.